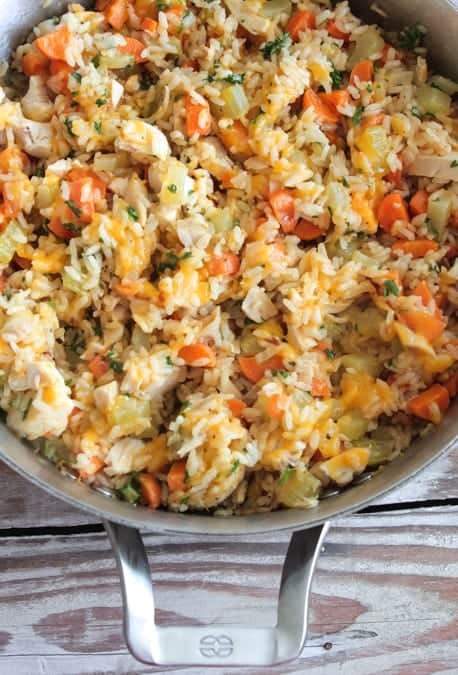 My Weeknight Cheesy Chicken and Rice makes the perfect dinner for the whole family! 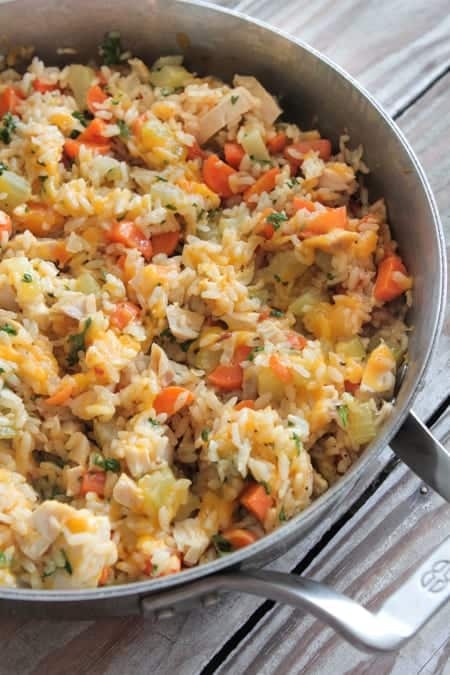 Flavorful rice packed with chicken, vegetables and just the right seasonings! 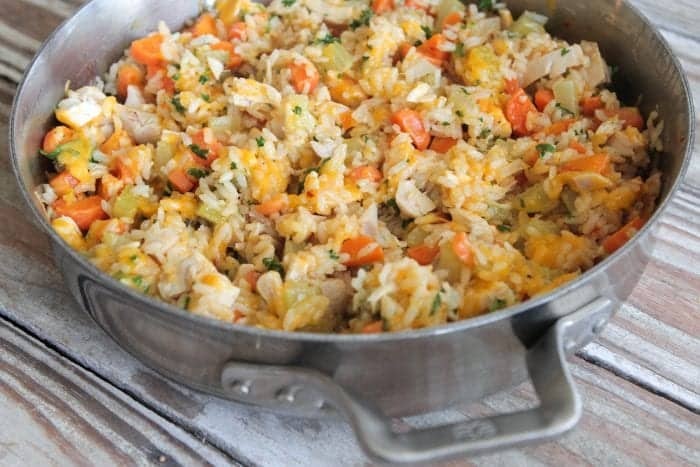 Chicken and rice recipes are some of our very favorites to make during the busy weekdays. You are in for such a treat with my Weeknight Cheesy Chicken and Rice recipe! I love making quick and simple weeknight dinners. 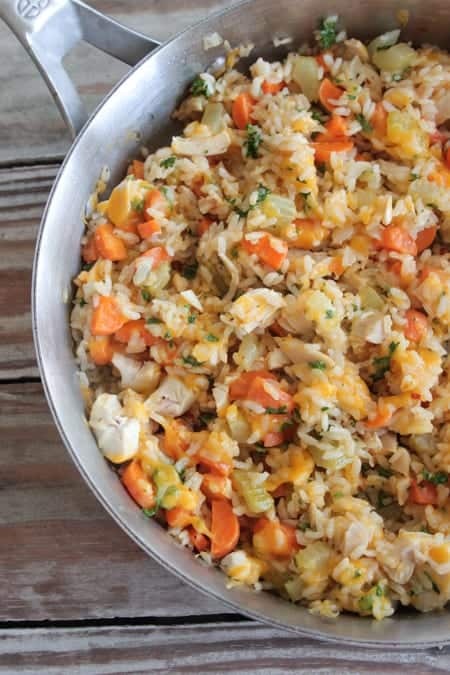 My family goes nuts for this flavor packed one pot dinner Weeknight Cheesy Chicken and Rice. Love that you won’t be making a huge mess in the kitchen with this one. One pot dinners are my favorite! I used a rotisserie chicken for the chicken in this recipe. Feel free to cook your own if you desire. Pre-chopping your veggies helps with your prep time. Try my Crock Pot Chicken and Rice recipe too! Follow Picky Palate on Instagram for daily recipe inspiration! Made another step by step video for you today. Check it out and follow me on You Tube for lots of recipe videos this year! If you would like, this recipe makes a great freezer meal too. Make a double batch and freeze one dinner for another time. Perfect for giving to a friend in need as well. See other Picky Palate dinner recipes HERE. Packed with veggies and loaded with oozing cheese on top. My favorite! Use cooked proteins from the grocery store to help save time. We like to buy a couple rotisserie chickens at the beginning of the week to use for a couple dinners during the week. Pre-chop veggies ahead of time. This is a huge time saver as well. Try to map out a meal plan at the beginning of the week so you are not at the grocery store numerous times buying groceries for dinner. This is so easy! And good! Did you use minute rice or long grain? This looks so delicious Jenny! Such an easy weeknight recipe! LOVE! This is an ok dish. I taste a little too much garlic but I’m not a huge garlic fan. I even used garlic powder instead of fresh garlic to tame it down. Not sure if I would make it again but my 16 year old daughter loves it! This looks really good! Could you bake this in muffin tins, for a nice snack size or take with? Looks delicious – love a veggie packed meal!! I’ve made this twice now—once when it was first posted and then again today. It’s not a “wow” dish, but quick, easy, and good. I used long grain white rice both times and while 15 minutes is perfect for getting all the broth soaked up without drying the rice out, I still end up with crunchy rice because there isn’t quite enough liquid, I’m guessing. Still a good flavor, but a note to myself—maybe add another .5-1 cup of broth and cook an extra couple of minutes. Mindfulness helps boost your sense of creativity. and instead to focus your mind in taking note of new things. engage yourself in activities that’s taking place in the present moment. 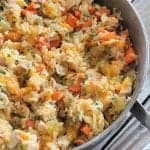 Could you do this as a slow cooker recipe with raw chicken breasts, first sauntering the carrots, celery and garlic and then putting all ingredients but cheese in slow cooker? How many hours on high/low? Then put cheese on top for last 15 minutes on low. I am making this recipe right now. After I sauteed the vegetables I added the rotisserie chicken and the seasonings so the flavor will cook into the rice and chicken. I’ll let you know how it turns out. There’s an annoying amount of duplicate comments as well as inappropriate ones, can’t they be removed? I am making this recipe right now. After I sauteed the vegetables I added the rotisserie chicken and the seasonings so the flavor will cook into the rice and chicken. I’ll let you know how it turns out. There’s an annoying amount of duplicate comments as well as inappropriate ones, can’t they be removed? It turned out very good but definitely use minute rice, add more chicken broth and let it sit after cooking so the rice absorbs the liquid. So make sure you can be found on the day that you’ve got chosen for set up. My boyfriend and his roommate including his son loved it! Thank you for sharing! Soooo good. The first time I used regular brown uncooked rice. The rice never cooked despite the addition of more broth and water. Second time I used minute brown rice and it came out perfect! I really appreciate your noteworthy innovativeness exhibition and thank you such a great amount for sharing us.